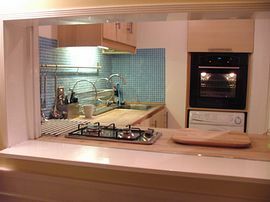 Edinburgh's self-catering Castle Apartment is in the centre the Old Town of Scotland's capital. The holiday flat is in a traditional Victorian tenement. There is a magnificent view of Edinburgh Castle from the living room window. It's a great home base for independent travel on a Scottish vacation. The warm and comfortable interior has been completely modernized-free WI-FI, DVDs, Freeview and there is full central heating and a well equipped kitchen. 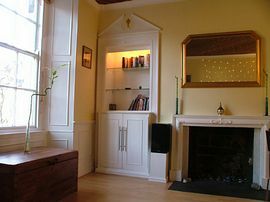 Castle Apartment is in Edinburgh's historic Grassmarket. This large open square was the scene of public hangings, the Porteous Riots and the haunt of the notorious body snatchers, Burke and Hare. There is a wonderful selection of specialist shops, pubs and restaurants on your doorstep and it is only a three-minute walk to the Edinburgh Royal Mile. During the Edinburgh International Festival and Fringe, this lively area overflows with street performers, musicians and special events. The Royal Mile starts at Edinburgh Castle and leads down to the Royal Palace of Holyrood and the stunning new Scottish Parliament building. A large peaceful park, the Meadows, is only a few minutes walk away from Castle Apartment. Stunning view on to Edinburgh Castle. Right in the heart of the Old Town. It is best to take the frequent and cheap bus service into town that leaves right outside the terminal. It will take you about 25 minutes, terminating outside Waverley Station. 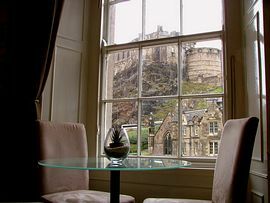 From here, take a five minute taxi ride to the GRASSMARKET area. Ask the driver to drop you opposite the Black Bull Pub, where you will see the archway leading back to the apartment. 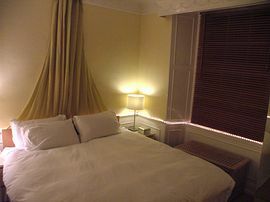 Prices from: £60 per night to £100 per night. This is for the whole apartment, which can sleep up to four persons. Price includes all gas, electricity, fresh linen and towels. Payment is by cash, cheque, postal order or money transfer. 50% non-refundable deposit payable on booking, with balance on arrival. Normally bookings are from 4pm until 11am of the leaving day but let us know what suits you and we will arrange something. Maximum four adult guests only. Children welcome. Any excessive damage to the apartment must be paid for before departure.